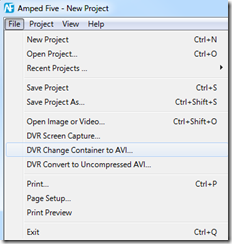 To use the new conversion tools, you just need to go to File > DVR Change Container To AVI. In some cases, there are issues, mainly due to multiplexed compressed video streams and timestamp decoding (especially on variable frame rate videos) but we are working on these too and will release an update as soon as possible. First, if a file cannot be opened in FIVE, the user is asked if he wants to convert it right away. This speeds the process without needing to go to the File menu. 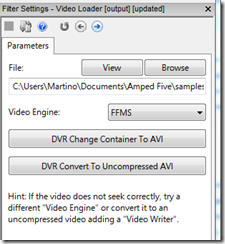 Second, if you have issues with seek/skip or playback control functions in a file, now you can simply convert it from the Video Loader filter settings panel. 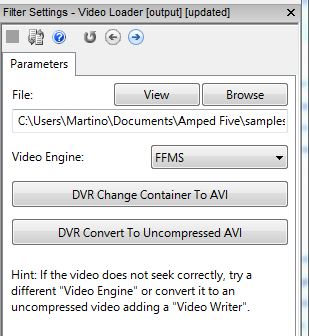 This also speeds the process on videos that play in Five, but have playback control or other issues. This makes for an easy and an efficient workflow. The amount of time wasted Googling players and codecs can now be used on more important things. 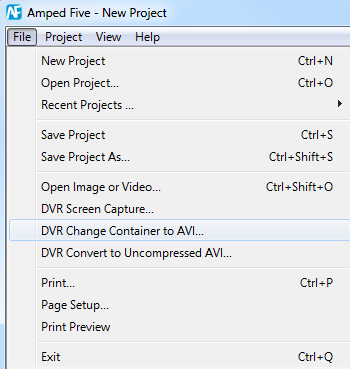 When many analysts spend 75% percent of their time just converting video, we cut that time dramatically with some new tools to help you do your job in Amped FIVE!